The Ledges Golf Course comes with unique views of its own. The red rock panoramas from the rim of Snow Canyon State Park make you feel like you’re playing golf in a postcard. Designed by renowned golf course architect Matt Dye, this course has a friendly atmosphere with an upscale pro shop and delightful restaurant. Four separate tee boxes with long and open fairways promise a rewarding round for everyone in your group. The front nine is set up well to help you break in your driver, and the back nine is a great test to see how well you can control your irons. Sitting 900 feet above the St. George, Utah, valley, and breathtakingly close to the Snow Canyon State Park cliffs, the views on The Ledges Golf Course are as magnificent as its greens! From the stunning tees, meticulous greens and stunning panorama, you’ll feel like you’re playing in a postcard on every hole. 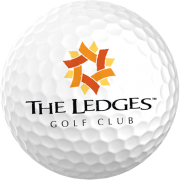 The Ledges Golf Course features an acclaimed Golf Academy, an incredible teaching facility that includes a championship short game area, 3 climate controlled teaching bays, precision video cameras and swing/putting analysis software with the best golf instructors to be found anywhere. Combine the grandeur of the landscape, and innovative design with a brilliant clubhouse, Fish Rock Grille restaurant, remarkable banquet facilities, high-tech teaching center and outstanding driving range and you can understand why The Ledges is a common stop for practicing pros and recreational golfers alike. Absolutely love the course and our experience at the Ledges. Stayed right on the course in one of the vacation condos – “Poolside Perfection”. Great location overlooking the pool and the 9th green.